Hungarian writer and historian György Dalos was born in 1943 in Budapest. His Jewish father having died in a labor camp in 1945, Dalos spent his childhood at boarding schools, where he had a religious upbringing and learned Hebrew. His grandmother also taught him German. From 1962 to 1967, Dalos studied history at Lomonosov University in Moscow and later worked at the Museum of the Labor Movement in Budapest. In 1964, he published his first poetry collection, »Szavaink születése« (tr. Words of Birth). In the 1968 »Maoist trial«, Dalos was put on probation. For twenty years, he was not allowed to publish works in Hungary, and thus worked primarily as a translator of German and Russian. His experiences from this time flowed into his story »Kurzer Lehrgang – langer Marsch« (1985; tr. Short Training, Long March), a text that unites autobiography with contemporary history and literary devices. In 1977, he participated in the establishment of a democratic opposition movement in Hungary, determined to challenge the country’s authoritarian politics. Since then, more relaxed travel regulations allowed Dalos to travel not only within Hungary, but also to the GDR and West Germany. Hans Magnus Enzensberger, Thomas Brasch, and Peter-Paul Zahl prepared his texts for publication. In 1984, Dalos was a guest of the DAAD Artists-in-Berlin Program; afterwards, he worked at the Research Center for East European Studies at the University of Bremen. In 1988/89 he belonged to the East German underground magazine »Ostkreuz«. He reflects upon the time of upheaval in his homeland and the challenges of the present in books such as »Archipel Gulasch. Die Entstehung der demokratischen Opposition in Ungarn« (1986; tr. The Goulash Archipelago: The Formation of the Democratic Opposition in Hungary) and »Ungarn in der Nußschale« (2004; tr. Hungary in a Nutshell). From 1995 to 1999, he directed the Hungarian Cultural Institute in Berlin; in 1999, he coordinated the guest of honor program for Hungary at the Frankfurt Book Fair. Until the end of 2011, he was co-editor of the German weekly newspaper »Freitag«.Over the last 15 years, he has mainly written books about history, including topics such as the Hungarian Uprising of 1956; the end of dictatorships in Eastern Europe; the politician of the Perestroika, Mikhail Gorbachev; the history of Russian Germans; and the last Russian tsar, Nicholas I, and the fall of the monarchy. In his novel »Der Fall des Ökonomen« (2012; tr. The Economist’s Downfall), he returns to his memories as a dissident and describes life as an intellectual in Hungary between 1950 and today. 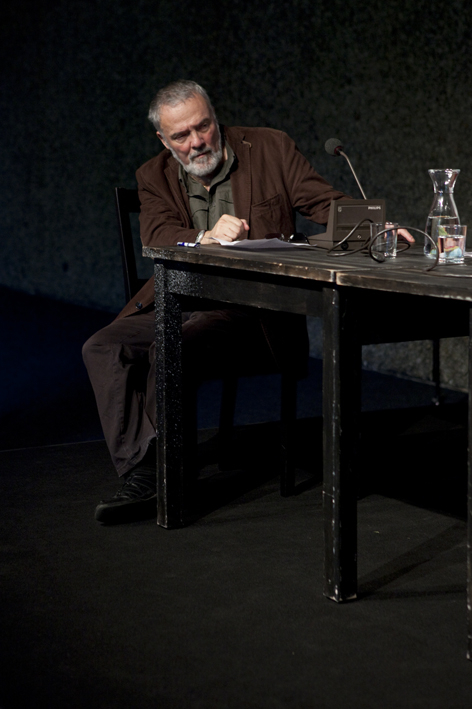 In 2010, Dalos was awarded the Leipzig Book Award for European Understanding. In 2014, he was named Secretary of the Class of Literature and Language of the Saxon Academy of Arts. His books have appeared in translation in the UK, France, Denmark, Sweden, Japan, Turkey, Portugal, Russia, Australia, Israel, the USA, and the Netherlands. He lives as a freelance writer in Berlin.